For a long period of time, especially during the late 1990s and 2000s, Jet Airways was the shining face of Indian aviation. But now it finds itself on the verge of collapse. What went wrong? The BBC's India business correspondent Sameer Hashmi explains. Over the last decade it grew steadily - becoming India's largest international carrier. But the airline, which celebrated its silver jubilee just last year, is now fighting for its survival. With elections scheduled to start next month, Prime Minister Narendra Modi wants to stop the airline - which employs 23,000 people - from collapsing. The "rescue mission" is headed by the State Bank of India (SBI), the country's largest public sector bank. Its head, Rajnish Kumar, on Thursday said that lenders are close to working out a resolution plan. Air India's former executive director, Jitender Bhargava, says it will be very difficult for banks to find investors - given the current financial mess the airline is in. "Who will be ready to put in money when profitability is not on the horizon? You cannot put in money to sink it." "If immediate cash is injected and the aircraft that are grounded start flying again, then the airline can be rescued. In the current scenario, Etihad is the best bet for Jet Airways," he said. "Mr Goyal has always wanted to keep control of the airline at any cost. Even in the past when the airline was going through tough times, he turned down deals to protect his position," says a former senior executive of Jet Airways who didn't want to be named. "Mr Goyal stepping down will open up a lot of options for the airline. Any investor that is willing to invest would want full control and to run it professionally," says Mr Bhargava. An email sent to Jet Airways regarding Mr Goyal's future did not elicit any response. "The biggest challenge for Jet Airways was that its operational cost was much higher compared to low-cost carriers, which is what prevented it from making profits," says Mr Bhargava. "These two factors really dented the airlines' cash flow, and it couldn't recover from there," says Mr Sabarad. 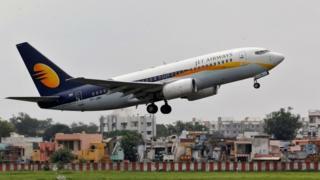 To make matters worse, the airline's pilots union has said they have decided to stop flying from 1 April if Jet Airways does not have a rescue plan in place by then. "It is not about the salary right now, it is about getting clarity about our future. We have bills to pay, and many of us are sole breadwinners in the family," Asim Valiani, vice president of the union, told the BBC.